Once imagined as an answered prayer, the long-awaited showdown between the two greatest fighters of this generation, Floyd Mayweather and Manny Pacquiao, was instead a fairly epic failure, widely purchased and even more widely reviled, and, months later, lingers as a topic of uncomfortable conversation and a general pox on the house of boxing. Gun-shy consumers still smarting in the aftermath of May’s grand non-event voted with their shuttered wallets when offered the opportunity earlier this fall to anoint a new pay-per-view star, Kazakh destroyer Gennady Golovkin. Even from the perspective of someone who did not buy that fight card live, or particularly feel it PPV-worthy, it was still a disappointing result, despite solid in ring efforts at the top from Golovkin and direct support Roman Gonzalez, the post-Floyd world’s current #1 pound for pound entrant. This came as an unfortunate bump in a road that had otherwise trended steadily up for the sport at large, with the choking, multi-channel ubiquity of Al Haymon’s Premier Boxing Champions franchise delivering unfocused but occasionally tremendous – especially on SpikeTV and ESPN – action to the masses, and HBO, home of every non-Floyd PPV star plus numerous others – Kovalev, Crawford, Ward, Bradley – worth paying extra attention to, enjoying its best campaign in years. If fans had limited appetite for burnishing a new star, how they would react to not one but two already established stars – Puerto Rican four-division titlist and current lineal Middleweight champion Miguel Cotto, and hard-punching, 25-year-old Mexican matinee idol Saul “Canelo” Alvarez – matched together in arguably the best paper fight available anywhere, would go a long way toward establishing a boxing landscape in which the page could finally, definitively be turned…that is, until Floyd anticlimactically comes out of retirement once again for the purpose of more mercenary self-aggrandizement – albeit with a twinge of real history to it for once – rendering all the good work and hard-won momentum of so many others moot in the process. You can tell I’m a fan. Saturday night, at Las Vegas’ Mandalay Bay, the air was thick with history. Puerto Rico’s Cotto, the soft-spoken warrior with a dignity and personal elegance that always belied his surgical aggression within the ropes, would be defending the legitimate Middleweight championship of the world for the third time. Saul Alvarez, the piston-punching pressure fighter trapped in the body of a Mexican pop star, sought entry into his own second weight class as champion by defeating one of the biggest, most respected names in the last decade or more of boxing. The pugilistic rivalry between their respective countries, built on the backs of all-time events like Salvador Sanchez vs. Wilfredo Gomez and Oscar DeLaHoya vs. Felix Trinidad, made for both a spectacular backdrop and just one more of several compelling storylines. Could the 35-year-old Cotto box smartly and efficiently enough to defuse and overtake a prime bull ten years his junior, or would the natural size and strength advantages of “Canelo” carry him to a decisive, career-defining victory? The folks tuning in were treated to an exhibition of both courage and carnage, and that rare sort of boxing match that is somehow just as intriguing in real time as it was in the lead-up. The card was golden beyond the main event, with Mexican boxer-puncher Francisco Vargas surviving an early knockdown and progressively steady onslaught to storm back with a shocking 9th round knockout over Japanese pressure cooker Takashi Miura in what will likely be in the year-end discussions on multiple fronts (fight, KO, round, comeback). There was also the spirited opening scrap between Ronny Rios and Jason Velez, in which Rios survived a dubious point penalty for borderline low blows to definitively put his imprint on a high action fight and secure the win. There was even the fun of listening to HBO’s ringside crew take triangulated potshots at two-time Olympic gold medalist turned cure for insomnia turned professional persona non grata Guillermo Rigondeaux, their barbs less restrained than ever – even from his advocates – now that HBO has essentially barred him from its non-PPV airwaves. Fans who put more stock in the so-called “eye test” than they do in measurables or analytics likely had a field day with the Cotto-Canelo showdown, and saw it unfold pretty much just as they’d envisioned. Cotto, who fought at 140 pounds for the bulk of his career before jumping to Welterweight in search of far bigger game, is perhaps the slightest built Middleweight champion (160 lbs.) in history, while Alvarez, a longtime Junior Middleweight who only had to gain a single pound to reach the contracted catchweight of 155, looked in the ring like nothing so much as a redheaded, freckled, all-terrain armored fighting vehicle. Cotto was on his heels almost the entire fight, dancing around and throwing everything he had, but the young Mexican walked through the fire with unsettling ease. The pattern repeated throughout the night. Whenever a round was close, an overly persuasive part of me thought Cotto, on the strength of his timing, consistent activity level, and lateral movement, had perhaps done enough to steal it, but one doesn’t steal a twelve-round decision against a talented opponent in his prime. It simply isn’t done. Alvarez answered IBHOF trainer Freddie Roach’s canny game plan and Cotto’s excess of finesse and determination with brute force, preternatural calm, and a surprising and edifying amount of applied ring intelligence, absorbing Cotto’s flurries and striking back with thudding force, seeming to flummox the veteran from time to time not merely with his abundant and apparent sub-mastodonic strength but crisp combinations deftly, and patiently, deployed. Canelo stalked and cut off the ring and moved into position while Cotto merely moved. Even in the moments when Cotto shone, Alvarez came forward with an air of inevitability, and his shots landed with visceral, wince-inducing impact, pushing Cotto backward, or occasionally, dramatically short-circuiting his progress with a sudden, timely connect – his close quarters uppercut was particularly devastating – as if flipping a light switch quickly off and then back on. 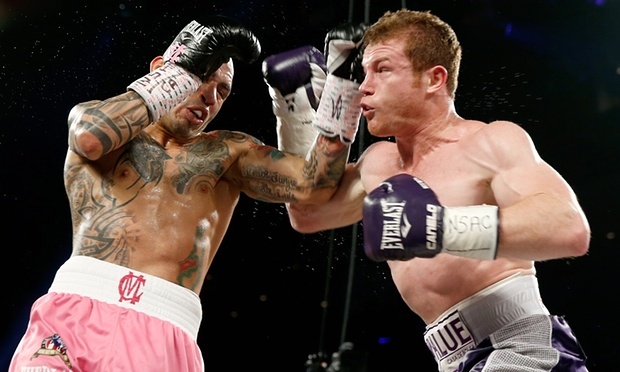 Beginning to buckle under the pressure of Canelo’s controlled assault, round eight appeared to be Cotto’s Alamo. I remember thinking it a heroic last stand as it happened, with fantastic two-way action for the first two-thirds until it settled into a sense of resignation at the end – in the challenger that he’d weathered the worst of the storm, and in the champion that the tide officially could not be turned. Cotto and Alvarez both tried to dig to the body, with Cotto successful on individual shots but not to the level he needed to be. At his best, Cotto is a pulverizing body puncher, but Alvarez’s defense was sufficient to keep him at bay whenever his own movement wasn’t inadvertently dampening his attack. In a situation that already presented a difficult puzzle and steep learning curve for the older champion, Cotto’s near perpetual motion ironically kept him afloat even as it denied him the ability to sit on his famous left hooks hard enough to generate the power necessary to hurt Alvarez, who might as well have been wearing a flak jacket for all the concern he paid the body blows Cotto was able to land. HBO’s Jim Lampley continually referenced Canelo’s “piledriving” style, and the impact and frequency with which Alvarez landed, easily discernable aurally, all too visible in between-round slow motion replays, and heartbreakingly evident after a while on Cotto’s zealously tenderized, slightly demoralized face, made the characterization seem cruelly spot on. Ever the artisan, Cotto crafted some beautiful sentences, which Canelo capped more often than not with an exclamation point that tended to change their meanings utterly. It was a brave, clever, commendable, and ultimately futile effort that I’m not prepared to say was totally wasted. Against Saul the Tank Engine, it’s entirely possible Marvin Hagler’s power wouldn’t have been sufficient to break through. DAE scored the fight closer than did HBO (117-111) or the three judges at ringside, 115-113 in favor of Alvarez. This is largely attributable to the fact that I had Cotto winning three of the first four rounds, which I thought were unreasonably hard to score. By comparison, Canelo’s destructive breakthrough in the third left little room for doubt. Seasoned judges, who don’t share my determination to instinctively complicate or second guess matters, saw the fight more clearly, if a trifle too one-sidedly for my conscience. It all depends on what you value. Cotto was the point of focus throughout the early going, forever on his toes and circling, uncorking the same professional combinations that disheartened and then flattened Delvin Rodriguez and Daniel Geale, moving in and out, never overcommitting or getting ahead of himself. He had faith in his own ability and in Freddie Roach’s instincts and real time observations, however susceptible Roach sometimes is to getting wrapped up in a self-provided narrative that crowds reality out. * Canelo, for his part, was steady and implacable, his same confident, stalking machine self but with a palpable sheen in arguably the biggest moment of his life that impressed observers both impartial and less than. You’ll never get me to believe, as asserted judges Dave Moretti and Burt Clements respectively, that Miguel Cotto won only a single round, or a lonely pair, but I do concede he lost the decision comprehensively. Cotto tried to dictate terms to the strikingly larger Alvarez** – who despite his celebrated run at Junior Middleweight (154), was very likely a rehydrated Light Heavyweight (175) on this night – and, sharply denied, found himself in a classic catch-22: be elusive, box, and probably lose, or be brave and get smashed. *Predictably, Roach thought Cotto had won a close but clear decision afterwards. He’s also just about the only person on Earth clamoring for a Floyd-Pac rematch whose motivation isn’t purely financial. He honestly believes Manny might have a shot. I wish he was right, on both counts. **At several points in the late going, Roach implored Cotto to get Alvarez, who generally moves in the ring like a runaway steamroller advancing in first gear, to go backwards, because, quite logically, he doesn’t fight nearly as well while “retreating”. That sentence caused me to spontaneously and reflexively laugh out loud, as if Will Ferrell had said it through a frightwig and novelty teeth instead. The not-35-year-old version of Miguel Cotto wrecked all kinds of shop at 140 and 147 pounds, of course. He was a master, routinely outthinking and outworking his opponents, making them pay dearly for their most foolhardy or hubristic moments…but to somehow push THIS version of Canelo Alvarez backward? Rarely has the gap between instruction and implementation been so vast. Next for Alvarez, according to the ridiculous WBC, whose sparkly trinket he acquired in the win, is a mandatory showdown with the fearsome, still undefeated Golovkin. While it would be quite the coup for a 25-year-old to go from participating in the best fight the sport had to offer directly to its logical successor in only two moves, I find it comical to think that the infamously lax and greedy WBC – a sanctioning body, remember, that is based in Mexico and has a long, unseemly history of intramural favoritism – would enforce any kind of ultimatum on a young and obscenely popular Mexican cash cow rather than simply coddling him to the point that observers come down with dry heaves. Therefore, whether the newly minted WBC Middleweight titlist fights Golovkin in the first half of 2016 seems entirely up to him. Based on this terrific performance, I wouldn’t put it past him, and I think any confidence he’d carry into such a hypothetical mega-match would be well-earned. It is an exponentially more fascinating and difficult in ring prospect than I would’ve allowed myself to believe beforehand, and a tantalizing next logical step for the rehabilitation of the sport’s image at large. To that point, it’s tempting anecdotally to read the relatively healthy fan turnout at my movie theater showing as an indication that boxing fans in general are finally ready to move past the lingering hangover of Mayweather-Pacquiao and get down to the business of boxing once again, but that kind of thinking only goes so far. Cotto-Canelo could’ve existed in a vacuum, and once the pay-per-view numbers are made public, maybe it’ll turn out that it did just that. This is the kind of high stakes, high impact fight that practically needs no additional publicity, which is fortunate, since the promotion fueling it was spotty at best. Jay-Z has the deep pockets and evident interest that could one day theoretically see him becoming a Bob Arum or DeLaHoya for the new age, but he has to know that signing the fighters and making the fight is only doing the bare minimum. This fight could’ve been just the tonic boxing needed, and, who knows, maybe its reputation will grow in hindsight in a manner commensurate with what its hype should’ve been going in. It certainly delivered in the ring. To watch the proud, noble, and fiery Cotto getting systematically chopped down over twelve rounds like an oak tree was a creeping, lurching feeling I hadn’t experienced watching a fight in some time, because whenever it seemed he was at his worst, his heels edging over the cliff and out into space, he invariably attacked his way back to a stalemate position from which Alvarez calmly started again. The true measure of a fighter lies just as much in how he handles defeat as in how he speeds to victory, which is, honestly, why Floyd Mayweather at his best still only ever really inspired indifference in me, and why Miguel Cotto, the tenacious veteran of so many memorable wars, some of which didn’t go his way, was such a sentimental favorite for me in a sport in which I so often assiduously try to avoid playing favorites. For his part, Canelo Alvarez, of whom I am also a fan, showed us all something real tonight, and took what felt like a critical step forward. He seized victory from a man fiercely determined to keep it for himself. He didn’t quite break Cotto, but he busted him up impressively. This most recent salvo was a worthy addition to the historical boxing rivalry between Mexico and Puerto Rico, to which HBO made periodic reverent reference in the build-up, and both men, in their determination and skill, made their famously fight-frenzied homelands proud. Alvarez, with his good looks, wild regional popularity, and punishing, workmanlike style, has been an inescapably noteworthy figure in the sport from the moment I first laid eyes on him, but tonight was the first time I ever remember thinking he might truly be special, because tonight he was special. His compelling victory over a man who is a veritable lock for induction to the International Boxing Hall of Fame might just be the kind of career accelerant that helps get him there one day as well.